Please enter all measurements in same units. Remember, the input can only be in feet (ft), inches (in), yards (yd), centimetres (cm), millimetres (mm) and metres (m) but never a combination of two different units!. . If you have inputs in different units of measurement. Please refer to our conversion table below. What is the difference between regular and irregular shape? Regular Shape: The sides and angles of regular shapes are all equal. Irregular Shape: The sides and angles of an irregular shape can be of any length and size. How to calculate area of an irregular shape? Now that we know the difference between regular and irregular shapes. Let’s make our calculation process simple by dividing the irregular shape into regular shapes. Check example below, here we have divided the shapes into triangles which is a regular shape. Then, you can easily calculate the area of each triangle by using the Heron’s Formula. After calculating area of each triangle, simply add all of them to find the area of an irregular shape. How to use irregular area calculator? Step 1: Measure all sides of the area in one unit (Feet, Meter, Inches or any other). 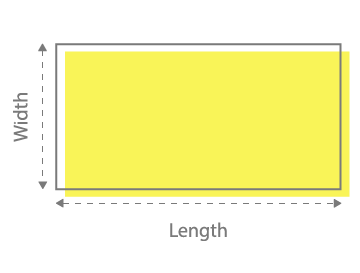 Step 2: Enter length of horizontal sides into Length 1 and Length 2. 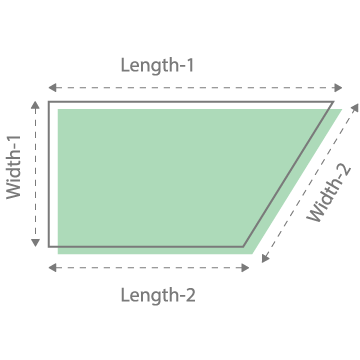 And Width of the vertical sides into Width 1 and Width 2. (See image above). Step 3: Press calculate button. The output our calculator provides is independent of the unit of measurement. For example, If you have entered values in feet. The output will always be in feet.